• Produce vivid colours with HP ImageREt 3600 and ColorSphere II toner. Optimize settings with HP EasyColor. 1Requires a wireless access point and an Internet connection to the printer. Services may require registration. App availability varies by country, language, and agreements. For details, see www.hp.com/go/eprintcenter. 2Feature only available on the HP LaserJet Pro 200 Colour M251nw Printer. 3Wireless performance is dependent upon physical environment and distance from access point, and may be limited during active VPN connections. 4Requires an Internet connection to the printer. Feature works with any connected Internet- and email-capable device. Requires HP Web Services Account Registration. Print times may vary. 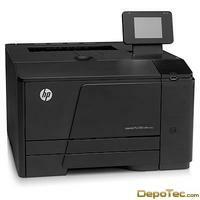 For a list of supported documents and image types, see www.hp.com/go/eprintcenter. And for additional solutions, see www.hp.com/go/mobile-printing-solutions. 5HP Auto-On/Auto-Off capabilities subject to printer and settings. 6Compared with products that use traditional fusing.